1. By union and abandonment to the Divine Will. See this adorable Will in all and always by the Faith, even in the smallest details, and always be united to this Will in all and through charity. The result of this is a very real permanent union with God at every moment, even when we are not conscious of it – our will being lost, as it were, in the Divine Will. 2. By the thought and remembrance of Jesus, either His intimate Presence in the depths of our heart by grace, His Eucharistic Presence in the Blessed Sacrament, or by His divine mysteries. Try to develop a greater and greater fidelity to this remembrance, and to arrive at an intimacy with God, as habitual as it is full of tenderness for the Divine Master. Avoid with great care the sentiments and thoughts of vain complacency; to consider that all that is in us belongs to God, and in serving him and serving our neighbor, we are only doing our duty strictly and rigorously. Prefer and seek to be in the last place. Never refuse a service in the measure that it is possible. Charity of the will in desiring sincerely the good of all. Charity of the spirit and judgment in thinking of the well-being of others, refraining with all our power from rash judgments. 4. Envelop oneself with a serious spirit of penance, both interior and exterior. 5. Put oneself especially under the patronage of saint Catherine of Siena 1 and to see in her the model of our interior life, our exterior life, and the apostolic life, which the Dominican tertiary ought to reproduce. 1. Remember that your life is really and totally consecrated to God. Even though living in the world you must live only for Him. Your life must be truly a religious life. “God alone”, that is your motto. Greatly desire this interior life. Ask for it by incessant prayers. by a purity of heart ever-growing. by a spirit of renouncement and of sacrifice. Get yourself used to acting, in all things, with a great interior spirit. Do faithfully daily mental prayer. Say vocal prayers (Rosary and Office) with a great interior attention. Develop in yourself devotion to the Holy Ghost and of the most blessed Virgin Mary. 4. Apply the spirit of renouncement and of sacrifice especially to the two great virtues of humility and gentleness, distinctive virtues of the Sacred Heart of Jesus, capable of establishing the soul in the very state of perfection, provided they are practiced generously. 5. Make recollection the principal object of your particular examinations (of conscience). Put yourself on guard against agitation and haste. Make an effort to possess oneself always in God, living in us. I was born into Protestantism. I called myself a Christian, but I didn’t recognize any authority other than my own conscience, and no revelation other than religious experience. I recognized in Christ a unique personality, but I refused to concede Him any supernatural character. Besides, the problem of the Divinity of Christ didn’t make sense anymore, in this day and age. Doesn’t God dwell within man? The divine and the human, don’t they make one and the same thing? Imbued, without even realizing it, with this pantheism which has poisoned modern thinking, I saw prayer not as an act of adoration or as the call from an indigent creature to its Creator, but as an excellent way of accumulating in myself the spiritual energies spread throughout the universe. In fact, I had lost any notion of the Divine transcendence and all sense of the supernatural. I never gave a thought to the laws of God. Besides, religion, being essentially a life, what does our Creed matter, provided that our religious experiences are strong? One must be broad-minded, if one desires to be penetrated by the breath of the Holy Ghost. I was broad-minded, very broad-minded, and I had a holy hatred for “narrow-mindedness”, that is those who held traditional ideas. My liberalism made me into a sectarian opponent of sectarianism! Disciples of the new liberal orthodoxy, my companions and I were virtually scandalized when we heard a preacher repeat an old formula or profess any veneration for Jesus-Christ which was in harmony with the Nicene Creed. As for Catholicism, it was the incarnation of all that we detested. Didn’t the Roman Church press an iron yoke upon souls? She was the most faithful ally of all reactionaries and of all those in authority. Happily the Church died slowly but surely, decrepit and powerless. The modern spirit was incapable of interesting itself in the old fashioned rites which made up the cult of the Catholic Church. Moreover, I was completely unaware of what those rites were. As I understood nothing of the gestures of the priest, the Mass (which I had only attended one or two times), appeared to me to be an artificial and theatrical ceremony; and I proudly compared the vain pomp of Catholicism to our cult in spirit and in truth. I had, like almost all Protestants, a conception of Catholic dogma that was absolutely false on every point, and I never even thought of verifying. In the spring of 1909 I went to the Kings College in London, a School of Anglican theology. I will never forget the first impression I had of the Anglican environment in which I found myself. The College Chapel was more like a Catholic Church than a Protestant one. I was astonished. I was even more astounded when I understood the thoughts or ideas of my companions. Their faith was dogmatic. They believed, like the Catholics, in the Real Presence in the Protestant Communion or Lord’s Table which they went so far as calling the Mass. For me, the visible Church was nothing more than a political and administrative machine; for them, she was the mystical body of Jesus Christ, his Spouse. My time spent at the King’s College would have a decisive influence on my entire life. I wouldn’t realize this until later however. At that particular time my liberal ideas weren’t damaged in the least. I had already entered the School of Theology of Paris in November 1909. My liberal Protestant tendencies, which Anglican influences began to undermine, without my having been aware of it, were accentuated again at the same time as was my hostility towards Rome. I soon became one of the most Rationalist students at the College. Exclusively taken up with social questions, I abandoned my Bible for the “apostles” of the Revolution. The crisis came suddenly in January of 1911. My whole being was profoundly shaken; I was forced to face myself and to put into question my most cherished ideas. I had exalted this earthly existence; I hadn’t come to the realization that our temporal life is fragile, fleeting, incapable of satisfying our most noble aspirations. Blinded by spiritual pride, I relegated “sin” to those old fashioned notions of days gone by; and behold! how I now awoke, poor and guilty, having an immense need of the love and forgiveness of God. I suddenly felt the need of a mediator and of a Savior, and the problem of the Divinity of Christ took upon itself an altogether new significance for me. Liberal Protestantism could suit, if need be, the rich and happy of this world, but it folds up before the great truths and realities of this life: sin, suffering and death. I understood that my most grievous fault had been to separate myself from Christ. Without Him, I sadly discovered, religious faith finishes being absorbed into a vague pantheism. I knew not yet if Christ was the Son of God, but I now knew He was the Way, the Truth and the Life. I resolved to place myself quite simply before the Christ of the Gospels without any preconceived notions, and to allow myself to be taught by Him. A work that I did at the School on the Cult of the Blessed Virgin Mary in the Middle Ages made me enter for the first time into contact with Catholic devotion. It was a true revelation for me. I found in the meditations and prayers of Saint Anselm, Saint Bernard and Saint Thomas, a fervor, a tenderness, a simplicity, which I had never ever been accustomed to. Saint Anselm made me understand the beauty of the dogma of the Communion of Saints. Why had I not till then believed what was evidently so natural? God, being the bond which held souls together, were not deceased Christians then more alive than us, and even closer to us? From then on it was easy to enter into contact spiritually with those souls and to ask their prayers. I persevered however in my daily meditations on the Gospels. The more I lived in union with Jesus Christ, the more He grew in my eyes. Not content with upsetting all the values of this world, Jesus dared to go so far as to say that none could come to the Father save through Him. He incarnated something of the Absolute. Upon returning to Switzerland, I took up first the Catechism of the Council of Trent, then the excellent manual of Father Lesetre called “The Catholic Faith”. I went from one discovery to another. I soon had to admit that the Catholic Faith had an extraordinary sense of the Divine about it. Nowhere was God so transcendent and yet immanent; so far and yet so close. He was the Unique, the Inaccessible, the Ineffable. “I am He Who Is”, said Our Lord to Saint Catherine of Siena, “and you are she who is not.” And yet the God who surpasses any framework of our mind, the God of the mystery of the Trinity, was at the same time the God of the mystery of the Incarnation, the God who had espoused our frail humanity in the Person of Christ, the God who continues to unite Himself to us in the Eucharistic Communion and who lives in the soul in the state of grace. Liberal Protestants and modernists, in neglecting the Divine transcendence, to insist uniquely on the immanence, belittled God, under the pretext of drawing man closer to God. Christianity was a revealed Religion, or it wasn’t: it therefore implicated a dogmatic element and Christians never considered Religion as a thing of mere sentiment. If Christianity was a gift from God, a revelation from on High, it must necessarily be a Religion of Authority. Neither the Protestant ‘solution’, nor the Anglican ‘solution’ of the problem of Authority was satisfying. Didn’t all Protestant denominations claim to have their roots in the Bible, and with equal right, because there is no authorized interpreter of Biblical Revelation? As for Anglicanism, where does the authority lie in this National Church, which holds within itself tendencies which are not only different, but contradictory? Perhaps only the Catholic Church had a conception of Authority which was capable of resisting all the effects of time and of satisfying all the demands of reason. I was incapable, at the time, to answer. But my duty (or task) was clear: I had but to study Catholicism very seriously and to redouble with fervor in my religious life. Three years of Protestant theology imbued me with the idea that the Religion of the New Testament was different from that of the Council of Trent. Was primitive Christianity truly in opposition with Catholicism? This question was vital to me. What I was searching for was the Religion which Jesus Christ had founded. I put my whole soul into re-reading the New Testament, leaving aside, as much as possible, any preconceived notions. I had already been struck for a long time by the Catholic character of certain passages in the Gospels and Epistles. I believed to have seen, in analyzing the notion of the Church in the Epistles of Saint Paul, that the great Apostle of the Gentiles already possessed all the essential elements of the Roman conception of the Church. — Was the Church human or Divine? When I condemned the subjection of Catholics to Rome, I had forgotten that the Church, in the eyes of a Catholic, was not an administrative organization, created by man, fallible and obsolete like them; but that, for a Catholic, the Church is the Spouse of Christ, She is animated and directed by the Holy Ghost. I had been wrong in believing the Church to be as it were a barrier between God and the soul, preventing the soul from communicating directly with God. I had forgotten that mankind is not made up of a simple dust of individuals, each one a law unto himself. Christians are the members of the body of Christ, and they only participate in the life of Christ by participating in the life of the Body, which doesn’t prevent them from entering directly into communion with Christ. In the same way as an arm or a leg united to the body directly experiences the effects of the soul which governs the body, so does the Christian united to the Church directly experience the effects of Christ who governs the Church. Personal observation also proved Catholicism to be right: it is in the Roman Church that one finds souls that have had the most direct vision of God. Saints such as Saint Francis of Assisi, Saint Catherine of Siena, Saint Teresa of Avila, who had received admirable revelations, distinguished themselves just as much by their scrupulous obedience to the Hierarchy of the Church. Dogma opened up an infinite amount of points of view; Dogma was even of such greatness that the Church would never have been capable of conserving it, and fully developing it without the assistance of the Holy Ghost. Heretics are always offering us a shriveled and mutilated Christianity; our poor human brains never being able to see but one side of things. The Rationalists, who denied the Faith; and The Pragmatists, who denied that man is endowed with reason. Yet, Catholic doctrine wasn’t a vague compromise between several contradictory tendencies. The more I studied it, the more I admired its harmony. Everything flowed from a single source: Jesus Christ. And everything tended towards the same end: the Glory of God. By no means did the unity of Dogma exclude the diversity of systems of thought, and the theologians divided themselves into numerous schools. Far from oppressing the intelligence, Catholicism essentially liberated it. Catholics were unaware of the painful divorce of mind and heart which so many Protestants suffered from. I was soon to experience myself this double action of the intellect on the heart and the heart on the intellect. The winter of 1911-1912 was not only for me a year of hard work, but also a time of fervent religious life. 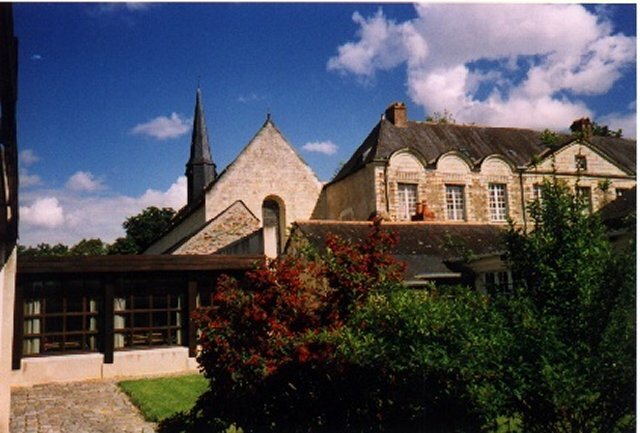 I loved to pass entire hours in the Chapel of the Benedictines. I hadn’t yet the Faith, but I often assisted at the Mass. The ceremonies which I had judged to be devoid of sense some years ago, took up for me a greatness all their own. Didn’t the Catholic have the privilege of assisting at the greatest Drama in History, the mystical representation of the Sacrifice of Calvary? In union with the Priest, he could even offer himself to God with Jesus Christ present in the Sacred Host, and unite himself closely in Holy Communion with the Sacred Victim. All other Sects appeared poor to me when I understood the profound Mystery of the Mass. A day came when God granted me the greatest grace of my life. On Easter Sunday, in 1912, while the Priest elevated the Consecrated Host, I was granted the grace to believe. I adored God made man, who continues to live with us under the veil of the Eucharistic Bread. My conversion was virtually completed. My Protestant friends tried to dissuade me by recommending a book to me called: “What One Has Made Of The Church” (which was anonymously written). It was full of errors and contradictions and made all sorts of accusations against the Church and Her Leaders. I must say that the long enumerations of scandals made no impression on me. There had been bad Bishops and even bad Popes. There would always be scandals in the Church. How could it be otherwise? The Church is Divine, but it is composed of sinful men. God promised infallibility to the Pope, but he never promised that he would be impeccable. God asks our collaboration, but He leaves us free to accord it or not to Him. It is this collaboration of God and man which makes up the drama of the life of the Church; and the great miracle of History is that the Church has been able to live and develop itself despite Christians. Conversion became for me a serious obligation. I had been led from liberal Protestantism to the Christianity of the Gospels. I now saw clearly that the Religion of the Gospels and Catholicism were one and the same thing. Orthodox Protestantism and even Anglicanism were nothing more than imperfect realizations of the Christian ideal. Only the Catholic Church had remained faithful to Christ and the glorious freedom of the children of God could not be found but in being submissive to the Vicar of Jesus-Christ1. Those around me asked me to wait a few months before taking such a decisive step. 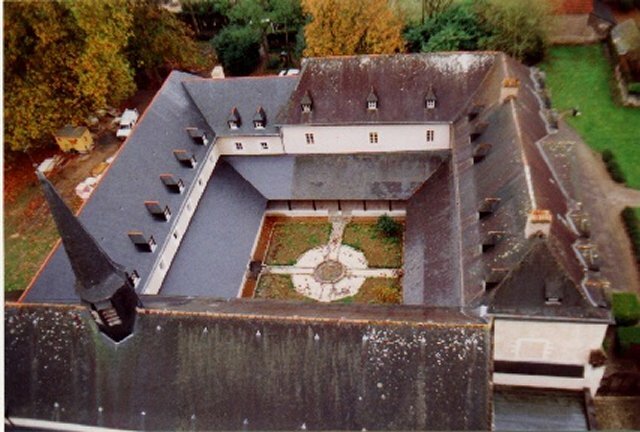 I wasn’t received into the Church until the Eve of All Saints Day, 1912, in the Dominican Monastery of Saulchoir. Andrew de Bavier (“From Geneva to Rome, by way of Canterbury” – abridged text). 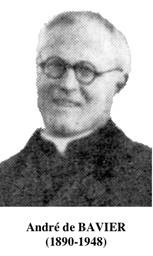 Andrew de Bavier was ordained a Priest on April 21, 1924. He passed away in 1948.